So, here we are, the final day of 2018. Another year in the books. If you have been able to keep up with the reading each day, at this point, you have read the entire Bible in less than 365 days, seeing as there weren’t any passages on Sundays. Now the question is, how will you apply all of it to your daily life? There is so much to read and try to apply from 66 total books. But, I think if you boil it down to just a few things that you can easily apply daily, the chapters for today give some great action steps to consider. First, in Malachi, we read about the coming Messiah and his pending judgment on mankind. But those set aside, those who have remained faithful, will be His treasured possessions (3:17). Although we know that Jesus has once walked this Earth in physical form once already, we know that he is set to come again sometime down the road. And, because of our faith, we have hope because we are STILL His treasured possessions. Second, in Psalm 150, we are reminded about God’s greatness and how we are to praise Him for all things. It reminds me of the video clip that Craig used for his Christmas Eve (and Christmas Eve Eve) sermon of treating everything as a gift. If we were to recognize that even the mundane things in our lives are gifts from God, then we would always give praise and thanks for those things. If you are like me, you tend to take things for granted because they have always been there. I’ve never known true hunger, or lacked clean drinking water, or electricity for more than a few hours. In modern times, people in their early 20s and younger have never known a time without the internet, or even smart phones. We just assume that we will have those things always, and sometimes forget that the fact that we have anything at all, even life itself, is a gift from God. In Matthew, we read of the resurrection. This is the coup de grȃs, what defines us as Christians. With the resurrection, we have hope in something else beyond our bodily, earthly death. We will be restored and be with God in heaven without any of the things that bring us down here in our current lives. In the Great Commission at the end, we get our charge from Jesus as to what we are to do with our lives while we are physically here on Earth. To go and make disciples of the people that we come across in our lives. And we have nothing to fear, because Jesus is with us, until the end of the age. So, there you have it. Three simple things to walk away with after a year of studying the whole Bible. Know that Jesus is coming again, and that we owe God our praise for everything we have every day, and we have so much to look forward to after this life. Today’s Devotional Thought: God is love. An intimate relationship with God will produce love. And, like light, love is intrinsic to the character and nature of God and those who know this God walk in his light. Saying that we love this God has to be more than showing up at church for an hour on Sunday or volunteering once in a while. Don’t misunderstand here…being part of the church is foundational to being a Christian and “volunteering” is important. I would submit to you, though, that the word volunteer is never used by Jesus. Why might that be? The answer, I think, is simple…loving God is not a thought or a feeling, it is a way of life. Loving God is seen in how we treat everyone around us…how we talk about people or think about others – those created in God’s image. Malachi Where do we begin? So much of the Prophets who spoke the word of Jehovah to Israel is so relevant to the church today. And our attitudes today are so much like that of the children of Israel back then. The biggest difference between them and us is we are supposedly filled with the Holy Spirit, while they were under the Law proving their need for the Holy Spirit. Nonetheless Jehovah spoke to them, through the prophet, and said He was unhappy with their offerings and wished someone would lock the door so they couldn’t offer such useless sacrifices. They were bringing in blind and maimed animals when they should have been the best and perfect from the flock. God was getting the leftovers. In chapter 3. vs 8 Jehovah offers a challenge to them and us, “Will a man rob God? Bring the whole tithe in and see if I won’t open the windows of heaven, and pour out blessings until it over flows!” Then He goes on to say “Then I will rebuke the devourer for you,…” It seems if we are unwilling to bring to God the whole tithe, something happens where there is a devourer who will take the extra we are thinking is ours and squanders it uselessly, be it unseen expenses we didn’t count on, such as car repairs, or other breakdowns. No one can say for sure how this happens but blessings do come from Jehovah and we know what is right to do, so don’t try to hold out on God. Psalms 148 A great Psalm of praise, read it. Note that it says in verse 5 to praise the name of the LORD. King James and pretty much all English translations of scripture substitute LORD for Jehovah, (YHWH) or God for Elohim. In the English we really should praise Jehovah, that is the true name of our everlasting Father. Mathew 27-28 This chapter starts with Judas who kills himself rather than repent of his sins, a poor choice. Pilate knew the Priests were lying, they were envious of Jesus, so he tried to wash his hands of the matter. Now we come to the crucifixion, outside the walls of Jerusalem, on a roadway where all crucifixions took place so everyone passing by could be warned against wrong doing by Roman rules. Understand also that this is taking place at the time of the Hebrew feasts of Passover, Aviv 14, and Unleavened Bread, Aviv 15, which also includes the Wave Offering of First Fruits. (Leviticus 23) So Jesus fulfills the spring Feasts as the perfect Passover Lamb, and Matthew writes in chapter 27.51 that the veil in the temple was torn in two from top to bottom; ( a sign of our access to the Holy of Holies i.e. God the Father,) and the earth shook and the rocks were split. It is understood through archaeology finds that the Ark of the Covenant which has been hidden and considered missing since the Babylonian exile, was in a cave, and still is, under the spot of the Crucifixion of Jesus so that when He was pierced in the side His blood fell down through the rocks to land on the Mercy Seat of the Ark Of the Covenant to symbolize, and fulfill our complete forgiveness of sins. ( In the Passover ritual the blood of the lamb was sprinkled on the Mercy Seat of the Ark, so was Jesus Blood.) Verse 52 tells us that tombs were opened when the earth quaked and many saints who were dead were raised, after Christs resurrection. They appeared to many in the holy city. In John 20.17 he records that Mary grabbed Jesus after the resurrection, and He told her to let go for He had not yet ascended to my Father. Now this reference is not to His ascension in the book of Acts, but to take the first fruits of the harvest to heaven as the First Fruits offering, a Wave offering to the Father. These resurrected bodies were the first fruits of the harvest yet to come. Thus Jesus fulfilled all the Spring Feasts, which were performed by Israel as a remembrance of the things past and a rehearsal of things yet to come. The high Priest of Israel would gather the sheaves of grain, brought in to the temple, and could not be touched by anyone until the Wave Offering was completed. So that’s why Jesus said “don’t touch me” to Mary. He must be ceremonially clean to offer the Wave Offering. Isn’t this stuff fascinating, to see the past and the present brought together in such minute detail. Our Heavenly Father leaves out no detail in fulfilling His Word. He won’t leave out any detail for that which is to come also. We are not following some cleverly devised tale, but the Living God of Israel, the Creator, KIng eternal, immortal, invisible, the only God, to whom belongs honor and glory forever. Review: A fountain cleansing is coming for the house of David (13:1)…Idols & false prophets will be shamed (13:2-6)…A Shepherd will arise for Israel (13:7)…2/3’s will be cut off, 1/3 will be tested and refined resulting in “My People” (13:8-9)…All the world is against Jerusalem (14:1-3)…The Mount of Olives, outside Jerusalem, will be split in two (14:4-7) resulting in an east-west flowing river (14:8) and usher in the LORD as King (14:9-15)…Even with this happening, some will remain unmoved and judged accordingly (14:16-21). A gathering of the nations against the Israel (14:2, cp. Rev. 16:13-16). A remnant will be delivered (14:3). The Messiah returns to a significantly changed Mount of Olives (14:4-8). All of the above brings the LORD’s Kingdom to fruition and with it full earthly blessing (14:9-21). That all this happens in response to prayer (Matt. 6:9-13, cp. Dan. 2:44-45, 7:24-28, Luke 1:26-33, 1 Cor. 15:20-28), even by we ourselves…Some will scoff and say that this is impossible, it could never happen…To that, my response is given what we’re experiencing, what we know of world these days, is this scenario far beyond the realm of possible…Further, it is certainly more possible for this to happen than any who have lived or is living to be on this livable planet in the first place as Heidegger attempts, unsuccessfully to my eye, to get to the bottom of…Happy New Year! Zechariah 11-12- In Zechariah’s prophecy, chapter 11, we read of the devastation and destruction of the nation, Judah and Israel due to their faithlessness, arrogance and misuse of power. Their kings, represented by the shepherds and lions, are not good and faithful leaders. The broken staffs: favor and union, represent the broken covenant with God. Destruction followed. The Romans subjugated the area and took control. In 70 A.D. Jerusalem was leveled by the Romans and in 73 A.D Masada fell. Chapter 12 speaks of God’s promise to reclaim and save his people; Judah and Israel. We read about the final siege of Jerusalem and God’s saving protection in end times. Proverbs 31:1-9- Here we find practical instruction for kings/leaders. Two things should be avoided by kings/leaders: 1. the accumulation of large harems and sexual indulgence and 2. drunkenness. What then, should a king and faithful leader focus on? Here’s what God desires; 8 Speak up for those who cannot speak for themselves, for the rights of all who are destitute. 9Speak up and judge fairly; defend the rights of the poor and needy. Jesus speaks of caring for the least of these (Matthew 25). Matthew 24- In Matthew we return to the discussion of faithfulness and unfaithfulness, judgment and end times. Verses 1-3 introduce the subject. Then verses 4-31 involve the “Last Days,” which began with Jesus birth and incarnation and will end with his Second Coming. Woven into these verses are events that have occurred as well as future end times and Jesus’ return. The abomination of desolation refers to 168 B.C. when Antiochus Epiphanes constructed a pagan altar to Zeus on the sacred altar in the temple of Jerusalem. There is imagery about the leveling of Jerusalem by the Romans in 70 A.D. Some day Jesus will return. What is clear is that no one knows when he will return, verses 36-44. What then should we do? How then should we live? See verses 45-51. We should live by faithfully serving our master; that is by doing what Jesus wants us to do until we die or Jesus’ returns. Devotional Thought- We celebrate the first coming of Jesus, his incarnation, at Christmas. We also eagerly anticipate his return and Second Coming. Jesus was born in a stable and placed in a manger the first time he came to planet earth. However, the second time he comes will be different. 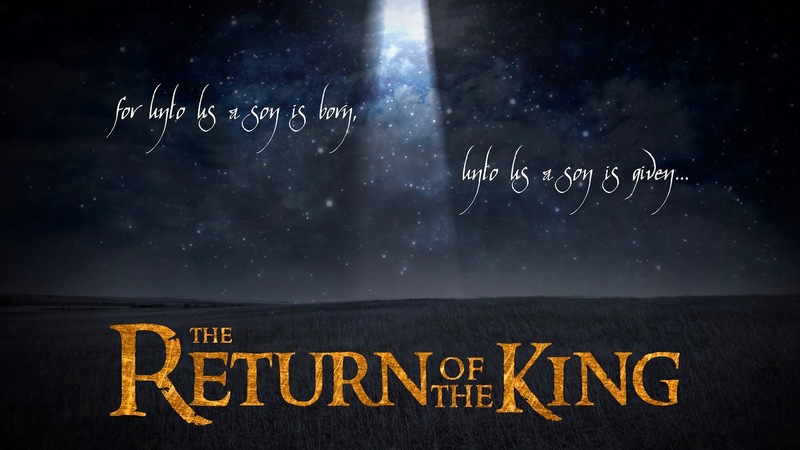 Jesus will return as Lord of all and be seated upon a Throne. All who love him and who have served him will celebrate his return and be welcomed into his presence forever. All who have lived in scorn of him will be found wanting and will be separated from Jesus forever. Now is the time to welcome the Lord Jesus and live for him. Zechariah: The last six chapters of the book are two messages delivered late in Zechariah’s life. These messages point to the Messiah and his second coming. Zechariah’s prophecy, more than 500 years before Christ’s first coming, called Christ the “cornerstone”. This Messiah would be strong, stable, victorious, and trustworthy—in all ways, the answer to Israel’s problems. Only in the Messiah will all the promises to God’s people be fulfilled. Israel will be regathered from present worldwide dispersion. God announced, I will signal for them. The term “signal” means “whistle” (as in gathering a swarm of insects) or “pipe” (as a shepherd using a reed pipe to gather his flocks. In regathering Israel to the land, God will remove every obstacle to restoration, pictured in terms of the ancient deliverance when He brought Israel through the sea on dry land. Psalm 148: The psalmist called all of heaven and its hosts to praise the Lord because He has established them by decree. And he called the earth to praise His glorious name because He had exalted Israel. Matthew 23: Well, this is a pretty tough chapter because it often pushes us to look at ourselves who can easily be in such a predicament. The hypocrisy and unbelief of the nation’s religious leaders, evidenced in chapter 22, prompted a strong message from Jesus. The key problem prompting the “woe to you” comments from Jesus stem primarily from the Pharisees placing their man-made rules, interpretations and applications of the laws on a plane equal to that of God’s law itself. The hypocrisy comes when such “rules and regulations” are not adhered to by the leaders themselves. 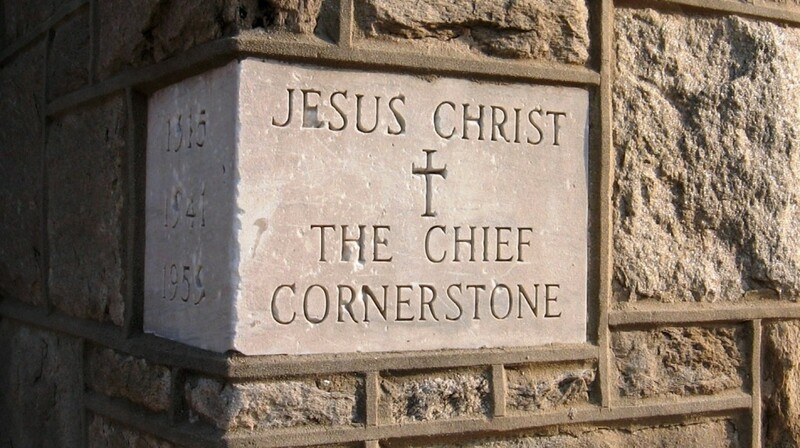 Devotional Thought: In Zechariah, the prophecy called Jesus the “cornerstone”. We all know what that means – the cornerstone of First Pres is on the far west side of the building by the old south entrance to the church – 1926 it was laid. This cornerstone is integral to the building. In a similar manner, is Jesus the cornerstone of your life? It’s really easy to get bogged down into believing that we have to follow a set of rules and regulations – manmade stuff, when Jesus makes clear a simplicity to living…love God and love others as yourself. Pretty simple, right? The key, I think, is getting the first part in your foundation…loving God. Merry Christmas!! Let’s deep into the word of God as we celebrate the birth of Jesus! Zechariah 7 is a beautiful reminder to do all things for God. He asks the people if they are respecting holy festivals for the Lord or for themselves. Who are you celebrating Christmas for? Eating, drinking, and being merry are all pleasures that God wants us to enjoy. So, while you’re doing them today make sure to thank God for His goodness and keep on celebrating. Zechariah 8 is a wonderful passage about how God will bless the people who anger Him. Even when the people mess up He remembers His promises and keeps loving His chosen people simply because He chooses too. He doesn’t want destruction. He doesn’t want punishment. He doesn’t like punishment–if He does discipline it is because He is a holy, perfect, and just God who must discipline His beloved the same way parents do. Likewise, your naughty teen may be grounded over Christmas break but you are still blessing them with Christmas gifts today. The Proverbs passage is really beautiful and I suggest everyone read it because it brings to light things of awe and wonder, things we may take for granted and forget to be thankful for (see again Zechariah 7 and the idea of doing everything for God: eating, drinking, being amazed by His wonders). Matthew 22 is eye opening. We, as descendants of Gentiles mostly, are the people on the street who are able to come to this amazing wedding banquet because the King’s (God’s) invitation was ignored by the people he invited (the Hebrews). Tax season is approaching so I’m just going to leave this little nugget here, “So give back to Caesar what is Caesar’s, and to God what is God’s.” Matthew 22:21. Remember, nothing is really “ours” anyway… We honor God with our life and while the excitement of Christmas may be wrapped in things the real joy of Christmas is a gift we cannot touch but can fully live. Matthew 22:37-40 is the greatest commandment and one we should be holding onto dearly: Love the Lord your God with all your heart and with all your soul and with all your mind.” As we celebrate Christmas today please don’t forget that it was Love that came down from Heaven to be born in a lowly stable so that we may know God. As you celebrate today by eating good food, opening gifts, laughing, and being merry please remember to worship God. You don’t need a church sanctuary to worship God. All you need is a thankful heart that does as the greatest commandment reads: Love your God with all your heart, soul, and mind. Israel had always been an interesting people. In their history as people, we can see them in all their glory or backsliding to the point the prophets speak of immediate destruction of them as a nation. It this swing that is interesting to me, especially in the light of the coming Messiah. Israel, as people of God, had this unique promise that God will come and dwell with them, live amongst them build God’s kingdom with them. And yet the ongoing issue that seems to trouble them comes from their fickle hearts. Zechariah speaks as the prophet of God, about rebuilding the temple and about the city being once again full of its formal glory. These are meant to be words of comfort, of encouragement for all those working in Jerusalem. At times we might ask ourselves how are things going to fall into place, how are the promises of God going to come to completion. And the answer is not the one we expect, it is not by who we are, the things we think we can do, but in wait, in listening and watching God’s plan unfold. When was the last time you heard: Not, by your power! Not, by your wisdom! By Faith, By God’s spirit. I would encourage you today to bring your prayers, your long list of things that you worry about before God, and speak those words: By your Spirit Lord, let it be done, I submit to your will. Here we are…Christmas Eve-Eve. While it would be easy to dive into a theological discussion about the connection of Matthew 1:23 and Isaiah 7:14, I’ll save that for another time. 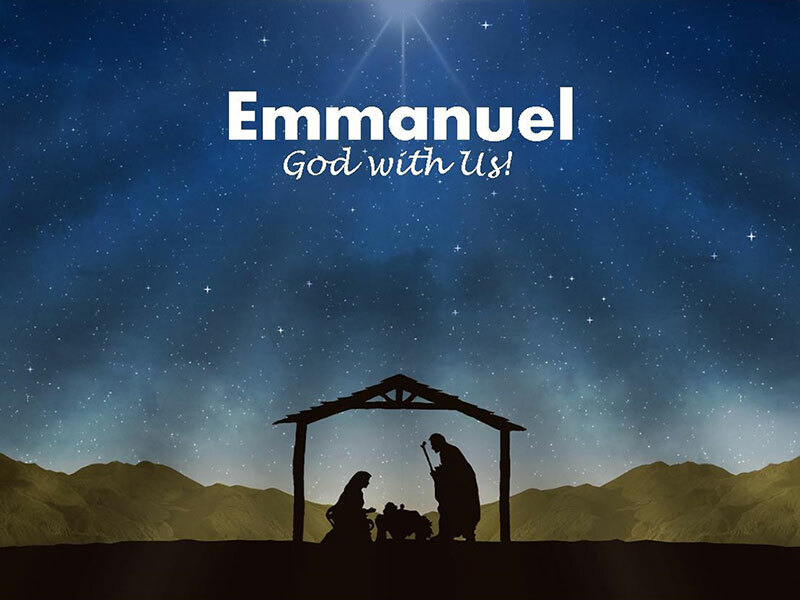 For today – this Christmas season, let’s lock in on Emmanuel…meaning God with us. We know that God crashed into our world over 2000 years ago as a baby in the Bethlehem hillside. This baby was named Jesus which means “the Lord saves” – Jesus grew up and showed humanity the hope, peace, joy, grace and love of God…then went to the cross to fulfill the meaning of his name and rose on the 3rd day. He then appeared to many – all of this as he promised. In one of his resurrection appearances he met his disciples on a mountain near Galilee and promised to be with them to the end of the age (Matthew 28:16-20). God with us to the end of the age!! By now you may be a little more tired, a little more frazzled – a little more cranky than usual…stop for a moment and realize hope, peace, joy, love and grace are right there…God with you…us…Emmanuel! Now, breathe a little easier and let a smile spread not only across your face but from your heart. Merry Christmas! !